June is the time of year that we put focus on all those that have battled and won against cancer. So let’s Celebrate Cancer Survivors Month! We spend a lot of the year bringing awareness to the different types of cancer, but for the month of June we want to Celebrate Cancer Survivors Month! This, of course, includes the men and women who had to endure the treatments and surgeries. But it also includes all of the family and friends that stood by them. It would be hard to find someone who has not been affected by cancer in some way. The good news is survival rates for cancer are higher than they’ve ever been. New treatment options combined with efforts to encourage early screening and detection have all helped. Women’s Cancer & Surgical Care is committed to continuing our efforts to provide the best care possible. Being cancer free is truly something to honor and cherish. It is a second chance at life and we’re overjoyed when we get to be a part of it. We are your partner in both treatment and celebration! Many people like to commemorate their cancer free diagnosis each year. There are community events scheduled all over the U.S. But a celebration at home with close friends and family is perfect too. Everyone involved should feel joyous and grateful for the health of their loved ones. Becoming cancer free is a wonderful thing. Staying cancer free is vital. While there are no guarantees, there is a lot that can be done to help keep the cancer from coming back. A healthy lifestyle (eating right, exercise, and NO smoking) combined with the recommended checks ups will go a long way. And never underestimate the power of a good, positive attitude. Celebrate health and a cancer free life. 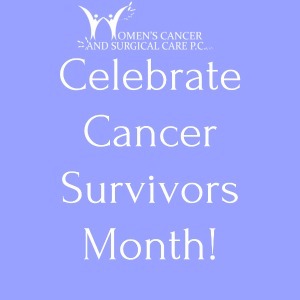 Celebrate Cancer Survivors Month!